Few of us will have the chance to visit an office designed by a world-class architect; an even smaller group will enjoy the luxury of living in a home designed by one. But for the price of a coach ticket, we can visit amazing spaces crafted by top designers, and enjoy their work while eating a slightly stale Cinnabon. 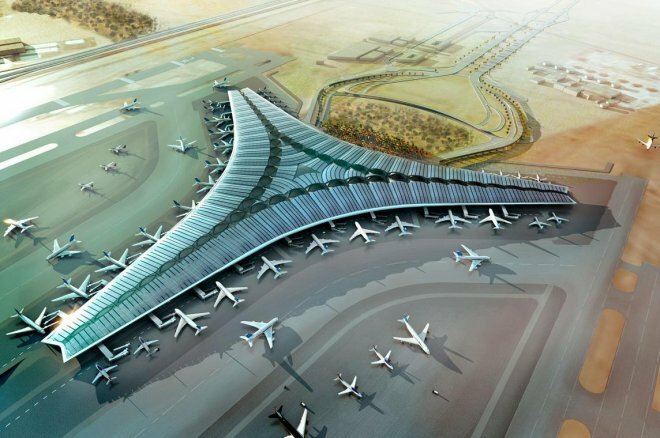 Airports, especially those in big cities, expose an architect's work to millions of people every year and are highly sought-after assignments. New projects are awarded through competitions that can span years; once granted, they may take decades to be fully completed. The latest airport award to be given will be happening in London. The British capital is facing an aviation crisis and mayor Boris Johnson has called on Zaha Hadid, winner of the 2004 Pritzker Prize, to help solve it. London's Heathrow Airport is an icon of air travel, but one that is ill equipped to handle the 300 million people who are expected to pass through its gates by 2030. Expanding the existing airport would require significant parts of the city to be razed, so Johnson has recruited some of the finest architects in England to propose entirely new facilities to be built on the banks of the Thames. "This work is essential to deliver the most integrated transport solutions for London and the UK," writes Hadid in an e-mail. "It will enable London to maintain its position as one of the world's most important economic, commercial and cultural centres; outlining the city's future growth and development which has always been founded on global connectivity." Hadid is a natural fit for this type of project. Her buildings, be they skyscrapers or parking garages, are typically composed of broad swoops and sinuous curves that often appear ready to take flight. Her design for the airport expansion in Zagreb, Croatia, (shown above) utilizes "a series of flow lines, set in a tapestry-like configuration" to give it a feel that combines traditional designs with futuristic elements. The final determination, however, is still being made, and the award won't be granted until 2015 — don't be surprised to see a stunning new design proposals take shape over the months and years to come. 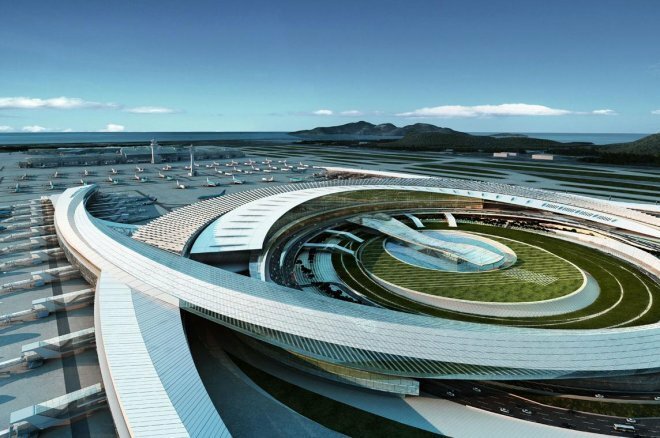 Meanwhile, here are eight other world-class airport projects, underway now, that will help push the field of airport architecture to new heights. Zaha Hadid is not the only architect working on a replacement for Heathrow. 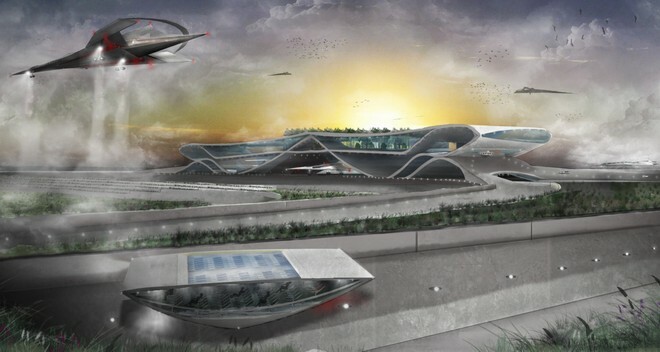 This alternate concept by mega-firm Gensler radically re-imagines what an airport could be, by designing it to float in the river. This design's sci-fi appearance is paired with equally ambitious technical claims. In this vision runways would be modular, floating structures that could be easily switched out for upkeep — or even replaced with spacecraft landing pads in the future. The floating structures would also generate power using marine turbines and provide a reef-like home for sea life. The design is bold, and slightly unbelievable, but does help recapture some of air travel's lost glamor. However, in order for it to be built it will need to beat a star-studded list of competitors and challenge a few laws of physics. 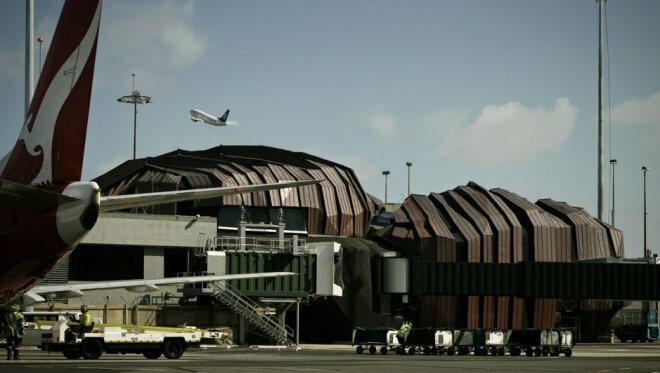 HOK, a firm renowned for their work at NASA's Johnson Space Center and the the Dalí Museum, won an international competition for the opportunity to help 43 million passengers a year visit Portugal. Details about the design are scant — the $4.5 billion project was officially put on hold in 2010 due to the international financial crisis. When it's given the clearance to take off, the structure will have four runways arrayed around a 5.2 million-square-foot, cross-shaped structure. While an airport that can serve over 40 million people with twice as many runways as Heathrow might seem like a bit of overkill in a country of barely 10 million people, smaller cities like Lisbon use these architectural opportunities to showcase their design capabilities as well as their local culture. Famed Spanish architect Santiago Calatrava provided the initial design for key components of the new airport, but when the funding was slashed from a first-class $650 million to a coach $500 million he withdrew from the project rather than trying to shoehorn his vision into a diminished budget. Calatrava was paid handsomely for the conceptual work, but Gensler (the firm behind the aquatic airport) has also been involved in the project design since its inception an will keep it on schedule for a slated for arrival in 2015. Looking less like a building and more like a spacecraft, this terminal features three wings, each three-quarters of a mile long, that meet under an 80-foot-high central canopy. Despite its extraterrestrial appearance, Foster + Partners designed the building to take advantage of the earthly benefits of the site. The building is flooded with sunlight through glass windows that have been designed to filter in light while reflecting heat, and the roof features large expanses of solar panels to harvest the power of the desert sun. 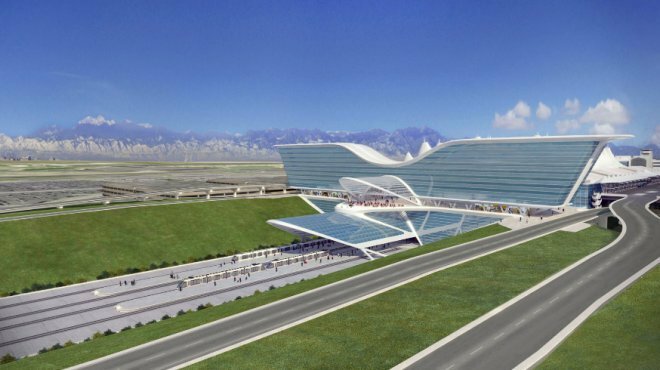 When finalized in 2016, the $3.2 billion terminal will be able to accommodate over 50 million visitors annually and will be the first LEED Gold-accredited passenger terminal in the world. The Pulkovo Airport will be the first structure seen by the 12 million annual visitors arriving in St. Petersburg when it opens in 2015. Grimshaw Architects, known for their aggressively styled renovations of English train stations, used this fact as their inspiration. Their design prepares visitors for the unique visual motifs they'll find in the Russian city and environment, and avoids the dull elements typically chosen by airport architects. The design of the 559,723-square-foot building is largely focused on the roof, which is flat on the exterior to evenly distribute the weight of the heavy snow that falls during long Russian winters. Internally, the structure was vaulted to help distribute the weight while also creating angular spaces reminiscent of Soviet stars with gilded surfaces that reference the gold roofs of the city's Tsarist architecture. The federal budget sequester that takes place on March 1 will likely force a number of air traffic controllers to lose their jobs or be furloughed, but if they can hang on until 2015, workers in San Francisco will have a new office that will make even the best-funded startups jealous. 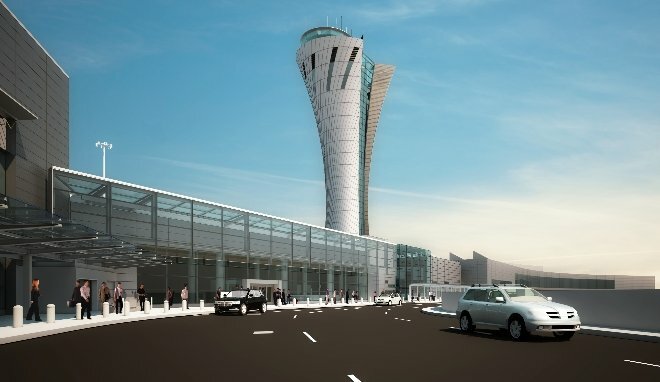 This new 220-foot-tall, $102 million airport traffic control tower will house the controllers in a 650-square-foot crow's nest filled with natural light and modern design details, while support staff, equipment, and security operations will be located in the structure's 44,000-square-foot base. While most air traffic control towers employ a charmless "Brutalist" style, Fentress Architects who also designed additions for the airports in Seattle and Los Angeles, developed a twisting design that would fit nicely into the city's skyline. It's not just a pretty facade, though; it's also engineered to withstand a 8.0-magnitude earthquake. Staying true to its Bay Area heritage, the structure will feature solar panels, be constructed with eco-friendly materials, and is targeting a LEED Gold certification and is expected to be fully functional in 2015. 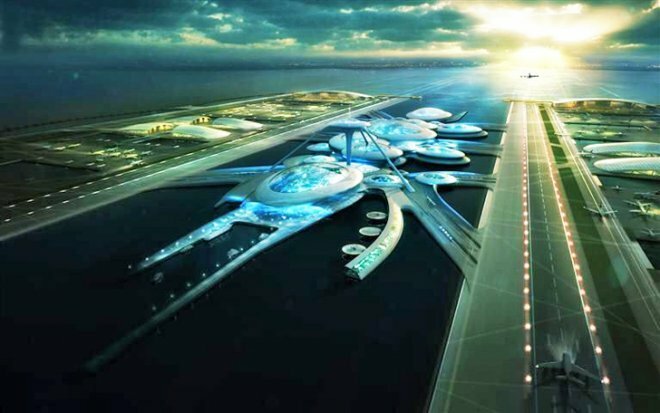 The managers of the Incheon International Airport held a design competition in 2011 with a creative brief requiring a single terminal that could accomodate 72 gates inside a 7-million-square-foot structure. It also had to be future-proof from a technology perspective, incorporate green building techniques, and be flexible enough to be reconfigured as the market evolved — a challenging request, but one architecture firm Corgan was willing to take in on. The project has a 10-year timeline, so we will be into the roaring 2020s before the first jet engine departs. In the interim, renderings of the speculative project are all that are available. While it may never be built, Corgan brought some new ideas to the project, eschewing typical aviation-inspired forms and instead developed a look that suggested a general sense of dynamism while respecting the cultural preference for balance. One does not simply walk out of New Zealand. Those who want to escape must first pass through the new departures terminal of Wellington International Airport. While it was completed in 2010, the airport's unique style, from architecture firms Studio of Pacific Architecture in association with Warren and Mahoney, begged to be included. Affectionately know as "The Rock," this new building can send 1,000 people on their way every hour, equating a respectable 6 million passengers a year. Five years in the making, its design is intended to both a sculpture as well as a transit building; its steel-beam and copper roof design is heavily influenced by the surrounding environment, especially the craggy rock formations that form the coast of the remote island — a deliberate contrast to the more aerodynamic look of most airports. Despite its stoney exterior, the inside of the terminal is paneled in hardwood and styled like a hip, mid-century lounge with strategically placed windows that offer views of the airport and otherworldly landscape.